If a picture is worth a thousand words then a functional 3D model is priceless when it comes to the design and testing process. We can help bring your ideas or small run production parts into the real world. Our 3D printing services can shorten the design and testing process. After all... Saving time and money while maintaining quality is a top priority for any project. Fused Deposition Modeling (FDM) is an additive manufacturing technology that builds parts up layer-by-layer by heating and extruding thermoplastic filament. 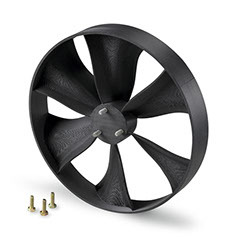 Ideal for building durable components with complex geometries in nearly any shape and size, FDM is the only 3D printing process that uses materials like ABS, PC-ISO polycarbonate, and ULTEM 9085. This means FDM can create parts with outstanding thermal and chemical resistance, and excellent strength-to-weight ratios. With our fast lead times and finishing options, FDM is a smart choice for anything from concept models to production parts. PolyJet is a 3D printing technology that jets layers of liquid photopolymer as thin as 16 microns (0.0006”) to build models and prototypes with extremely complex geometries, fine details, and smooth surfaces. You can even combine multiple materials in one print to create over-molded parts and models with multiple durometers. The PolyJet rapid prototyping process uses high-resolution ink-jet technology to produce parts quickly and economically – making it an excellent option for presentation models, detailed prototypes, and master patterns. 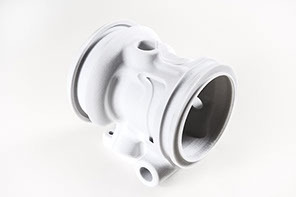 Selective Laser Sintering or SLS—creates tough and geometrically intricate components using a high-powered CO2 laser to fuse or sinter powdered thermoplastics. One key advantage of LS is that as a part is made, it remains encased in powder. This eliminates the need for support structures and allows for complex geometries. LS production parts can be strong, water and air-tight, heat resistant, and made out of exceptional materials like aluminum-filled and glass-filled Nylon 12. Direct Metal Laser Sintering (DMLS) uses a precise, high-wattage laser to micro-weld powdered metals and alloys to form fully functional metal components from your CAD data. DMLS eliminates time-consuming tooling, and creates complex geometries not possible with other metal manufacturing processes. Made from materials like Inconel, Aluminum, Stainless Steel, and Titanium, DMLS parts are strong, durable, and heat-resistant. 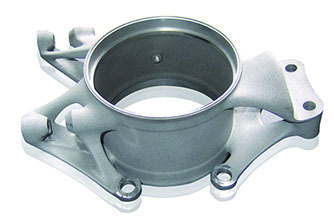 DMLS parts are also denser than investment casted metal parts. This accurate metal 3D printing process provides fine feature detail, making it ideal for complex oil and gas components, custom medical guides, consolidated aerospace parts, and tough functional prototypes. CNC Machining is a deductive process by which automated cutting tools remove material from a block of raw material or a pre-existing part. Components can be crafted from virtually any material—either sourced from our inventory or specially ordered for your project. 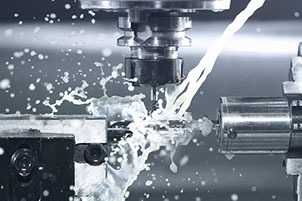 Our capacity allows us to create CNC machined parts with unrivaled speed, and our experienced engineers ensure the highest standards with cutting edge software and equipment. 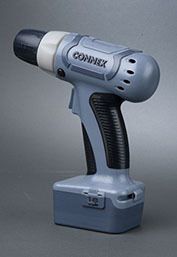 Ideal for prototypes, production parts, repeat-use master patterns, as well as a wide range of other applications where accuracy is critical.